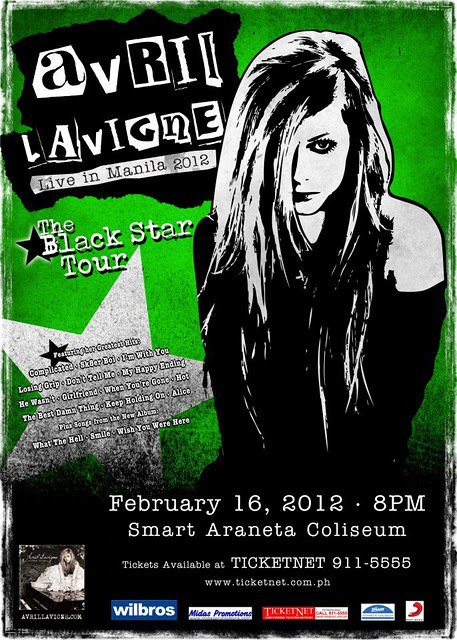 AVRIL LAVIGNE Concert Live in Manila on February 16, 2012 at SMART Araneta Coliseum is part of Avril Lavigne's "The Black Star Tour" Avril Lavigne Concert Live in Manila Ticket Prices: Patron Center - Php 7,920 ; Patron Sides - Php 6,340 ; Lower Box - Php 5,280 ; Upper Box A - Php 2,640 ; Upper Box B - Php 1,585 and General Admission - Php 530. Avril Lavigne a pop star starting early 2000 until now is famouse of Punk- Pop songs with her signature punk rock get up. Avril Lavigne The Black Star Tour Concert Live in Manila is presented by WILBROS Production Office. Avril Lavigne Concert Live in Manila tickets will be available at all Ticketnet outlets and at Wilbros Productions office. 2 comments: on "Avril Lavigne Concert Manila Live on February Ticket Prices"